Charles W. Howard was truly an American Original. Howard's professional Santa career is that of legend. He was born in the house that he would live in his entire life. The small town boy never left Albion, New York, except to venture out to be Santa. Howard first played Santa as a boy in a classroom play. As an adult he found himself asked to help a friend out and play Santa in a store front window in downtown Albion. This experience helped Howard's urge to perfect the role of Santa Claus as much as he could. In his early career Howard caught the train next to his farm in Albion and commuted to Rochester, New York and then Buffalo, New York to be Santa in department stores. 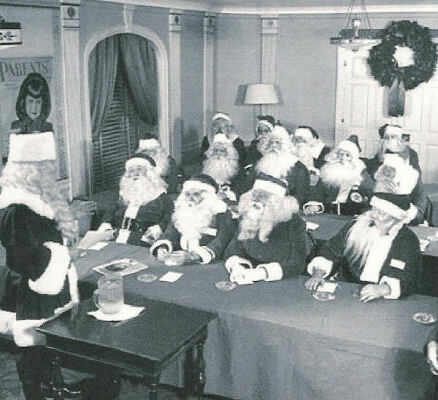 It was about this time he started to develop the idea for a "school" for Santas. Howard's first school was in the fall of 1937. Student from all over came to Albion. Stores like J.L. Hudson's in Detroit, Gimbel's in Philadelphia, Foley's in Houston, and Dillard's in Little Rock all sent students and executives to the school. Howard was even asked to go to Australia in 1965 to teach a special school there. Appearances on television, in magazines and newspapers included: What's my Line, To Tell the Truth, The Tonight Show, Life Magazine, and The Saturday Evening Post. He was also hired as a consultant for Miracle on 34th Street. The contributions of Howard's work are embedded in the Santa Claus world today. One of Howard's most memorable quotes sums it up... "To say there is no Santa Claus is the most erroneous statement in the world. Santa Claus is a thought that is passed from generation to generation. After time this thought takes on a human form. Maybe if all children and adults understand the symbolism of this thought we can actually attain Peace on Earth and good will to men everywhere."